Timothée Chalamet as Jim Quinn in "Prodigal Son," written and directed by John Patrick Shanley. Below, Robert Sean Leonard as Alan Hoffman, one of Jim's teachers. 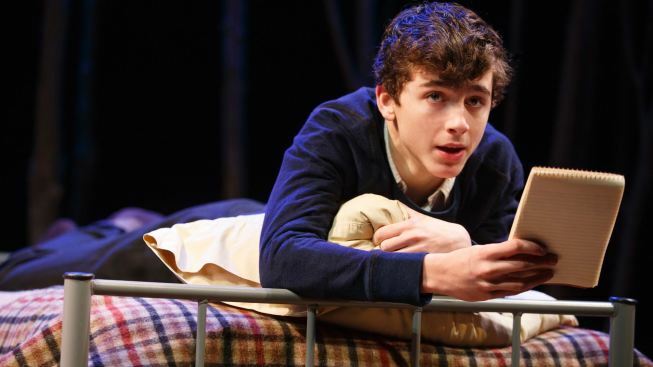 Charismatic actor Timothée Chalamet may be on the cusp of stardom with “Prodigal Son,” an enjoyable, if sometimes formulaic drama from author John Patrick Shanley. “Son,” also directed by Shanley, is having its world premiere at the Manhattan Theatre Club’s Stage I.
Shanley explains in a program note that the play is autobiographical. The marvelous writer of “Moonstruck” (an Oscar) and “Doubt” (the Pulitzer and a Tony) once was a troubled Bronx boy attending the stuffy Thomas More prep school in New Hampshire. That’s where this latest work is set. Here, the writer’s proxy is 17-year-old Jim Quinn (Chalamet), who wins a scholarship to the private school and adjusts to a rigid new life. Most of the story involves Jim’s interaction with three adults: the stern headmaster; the headmaster’s wife; and a teacher, played by Robert Sean Leonard, giving an out-of-character performance. “Prodigal Son” is a concise tale, with echoes of “The Catcher in the Rye.” Just as in the real world, people aren’t always who they seem to be. Jim, a prolific thief, gets into all sorts of trouble. For most of “Prodigal Son,” his graduation is in doubt. Headmaster Carl Schmitt (Chris McGarry, a regular in Shanley’s plays) and English department chief Alan Hoffman (Leonard) wrestle with whether the untrustworthy lad is a supernova or a dangerous mess. Chalamet will be familiar to some: He played young Tom in 2014’s “Interstellar,” and was Finn, the vice president’s son, on TV’s “Homeland.” Here, he’s a gangly and anger-fueled instigator, erudite, though the dialogue he’s given is too polished for even the sharpest teenagers I know. The kid holds forth on subjects ranging from Socrates to Whitman with the confidence of a doctoral candidate, but he’s most magnetic when dabbling in insecurity: “In comparison to the other guys here, how am I?” he asks one adult, in a moment that comes off as genuine insecurity about his physical appearance. Annika Boras is effective as Louise, the headmaster’s wife, who takes a mostly noble interest in the boy. David Potters does good work in a supporting role as Jim’s roommate. Leonard, as the closest thing Jim has to a mentor, has motives we’ve seen in these stories before, but the actor manages to color his character in shades of gray. Seeing Leonard at work on the grounds of a private school may conjure memories of “Dead Poets Society.” The similarities are purely superficial. The school is romanticized as a dollhouse at the back of the set. Redemption certainly came for Shanley, so there’s little question of how things will evolve for Jim. All the performances are good. The writing is classic Shanley: mellifluous, easy on the ears. The story, though, doesn't break any new ground. “Prodigal Son,” through March 27 at the Manhattan Theatre Club’s Stage I, 131 W. 55th St. Tickets: $90. Call 212-581-1212.